A low pressure fuel pump installed on an Icelandic Boeing 757 had never undergone its recommended maintenance, causing the pump to fail due to internal wear, according to an Icelandic investigation. This failure resulted in a serious in-flight smoke incident. An Icelandair Boeing 757-200, TF-FIJ, departed Paris-Charles de Gaulle Airport (LFPG), France at 11:39 UTC (13:39 local time) on June 4th, 2009 for its flight to Keflavik Airport (BIKF), Iceland. Seventeen minutes into the flight the flight crew noticed white smoke entering the flight deck. The smoke intensified rapidly to such an extent that the flight crew could barely see their instruments. Shortly after, smoke also entered the whole cabin section and intensified rapidly. The commander noticed engine #1 surging and shut it down. Shortly thereafter the smoke started to decrease. The airplane diverted and made an emergency landing at London-Gatwick Airport (EGKK) United Kingdom. The investigation revealed that the low pressure fuel pump installed on engine #1 had failed due to extensive internal wear damages. This allowed fuel to leak into the engine’s oil system. Fuel/oil mixture entered the engine’s main bearing chambers, where the seals could not contain it. The fuel/oil mixture then leaked into the compressor section of the engine. Inside the compressor the fuel/oil mixture generated smoke. 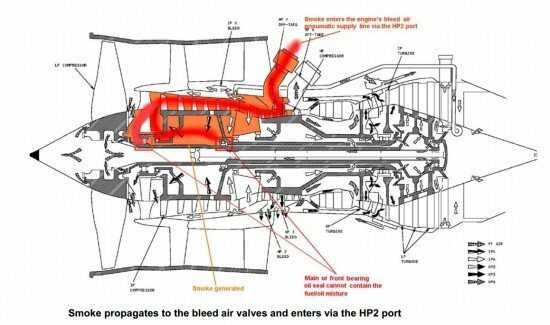 The smoke propagated to the engine’s High Pressure Port 2 and from there entered the engine’s bleed air system. Once in the bleed air system the smoke entered the left air conditioning pack and from there was distributed to the flight deck and the cabin. The investigation revealed that the low pressure fuel pump had never undergone inspection, repair or overhaul. The manufacturer of the low pressure fuel pump, as well as the manufacturer of the engine, had issued maintenance requirements for the low pressure fuel pump. The investigation revealed that the operator of the airplane had not implemented into its maintenance program tasks that would individually monitor the low pressure fuel pump utilizations and ensure its required maintenance was being performed. Several safety recommendations are issued.